Stable Flies resemble House Flies with their dull appearance and their 4 dark stripes on the upper body. These flies are 3/16”-5/16” long. The abdomen has dark spots. “Checkerboard” markings are obvious on the topside of the abdomen. Stable Flies have a needle-like, stiff, piercing mouthpart that protrudes forward below their head. Both sexes of Stable Flies feed on the blood of warm-blooded animals including people, cattle and horses. They are often a pest on farms that have cattle in pastures and feedlots. They often bite through clothing, especially on the ankles. Adults do not feed at night. After a blood meal, the adults fly to a vertical surface to digest their food. Females lay 40-80 eggs per batch and 10-12 batches in a lifetime. Larvae can develop in urine-soaked straw, chicken manure, compost piles, wet hay bales and grass clippings. The Stable Fly also breeds in vegetation strewn along the shorelines of lakes and bays and in accumulations of wet grass clippings from yards and golf courses. This is the fly you'll see on the forelegs and flanks of your horses so if you have horses stomping, it's these. 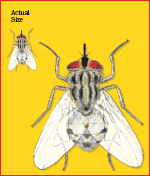 Stable Flies are not attracted to “odor” traps, but to specially designed Stable Fly Traps. Remove all rotting organic matter, manure, old hay bales, etc. Maggots burrow into the breeding material, following moisture inward as the substrate dries. Under favorable conditions, the entire egg to adult life cycle is from 21-25 days. This can be as long as 78 days in unfavorable conditions or in cool climates. Before pupation, the mature larva crawls to drier parts of the medium. Stable Flies overwinter as larvae or pupae. Stable Flies can move great distances. This often occurs when they are picked up by weather fronts and carried aloft for several hundred miles. Un-infested areas thus can become heavily infested almost overnight. Fly Predators parasitize Stable Flies and are an effective control tool. Proper sanitation and management of breeding areas will help control this pest. Research at Texas A&M University has shown that over one million Stable Flies may develop from the residue of one round bale feeding site. By cleaning any straw and hay and spilled feed that accumulates in pens and spreading it out to dry or disposing of it in a compost pile, their numbers can be significantly reduced. Stable Flies are not attracted to “odor” traps, but to specially designed Stable Fly traps. Since after a blood meal, the adults fly to a vertical surface to digest their food residual pesticide applied to those surfaces are often effective in decreasing Stable Fly populations.